I've already added Jane Johansson's The Trans-Mississippian to my blogroll, but I thought I would mention it in a post. Hers is the first blog from an academic historian to focus entirely on the T-M theater. She plans on posting 2-3 times per week, and I'm keen to follow her writing. The professor's Civil War books include Peculiar Honor: A History of the 28th Texas Cavalry, 1862-1865 (Univ. of Arkansas Press, 1998) and Widows by the Thousand: The Civil War Correspondence of Theophilus and Harriet Perry, 1862-1864 (Arkansas, 2000). Perry, an officer in the 28th, was killed at Pleasant Hill. 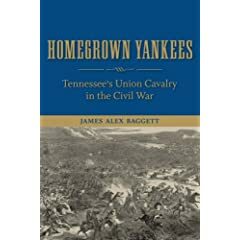 Baggett: "HOMEGROWN YANKEES: Tennessee's Union Cavalry in the Civil War"
Tens of thousands of white and black Tennessee men served in all three branches of the Union army between 1862 and 1865, yet no comprehensive study of their military service exists. A handful of still useful regimental histories were published by participants in the decades following the end of the war, but historian James A. Baggett's new book Homegrown Yankees: Tennessee's Union Cavalry in the Civil War is the first scholarly attempt to document the organization and combat history of the fourteen cavalry regiments (and, to a lesser extent, the eight short-term mounted infantry regiments). Baggett's work accomplishes much in filling this gap in the Civil War literature. It's safe to say the primary focus of Homegrown Yankees is on military operations, regular and irregular. The narrative is typical in its incorporation of biographical sketches of notable figures and selected quotes, and it is all done well. While the federal Tennessee units were most often engaged in rear areas safeguarding supply lines, garrisoning strategic towns, protecting Unionist civilians, and participating in counter-guerrilla actions, their roles in regular operations are also discussed at length by the author. The fighting at Okolona, Union City, Fort Pillow, Bull's Gap, and Saltville is covered in some detail. Additionally, the book recounts the regular use of unionist Tennessee cavalry during the Tullahoma, East Tennessee, Atlanta, and Nashville campaigns. Baggett also notes the cavalry's role in hindering and defending against a variety of attacks on the railroad supply lines feeding the federal army's 1864 campaign in Georgia. The "Homegrown Yankees" later joined in George Stoneman's 1865 raid into Virginia and North Carolina. In places scattered throughout the text, the author explores the Tennesseans's often poor unit leadership, uninspired combat performance, and penchant for plunder, but one might have wished for a separate chapter providing a more in depth examination of these traits*. Similarly, much of the author's discussion of membership demographics and motivation is relegated to his excellent conclusion chapter, when readers might have been better served to have this information presented at the beginning of the book. The book is bound in a very nice cloth covering and the publisher deserves plaudits for allowing the placement of the author's notes at the bottom of each page. The cartography is composed of large scale area maps (eight in total). While these aid in general orientation, they lack enough detail for a proper following of the movements described in the text. In terms of supplementary materials, an appendix usefully compiles information about the fourteen cavalry regiments, listing their commanders, engagements fought, and prior unit designations (if any). Overall, James Baggett's prodigious Homegrown Yankees is a well crafted and well researched effort. The level of background and operational detail well exceeds that commonly found in other works attempting comprehensive coverage of large numbers of associated units. This feature will ensure the book's enduring value as a useful resource and reference guide for researchers. Baggett's study is an important and original one, a signal contribution to the study of southern unionism and to the literature of the western theater military campaigns. * - On the other hand, some of the units did perform well. As an example, Baggett lauds the overall combat record of Brownlow's 1st Tennessee Cavalry Regiment, and, in places, the performance of the 3rd and 4th Regiments. Why wait until next April. Brett of TOCWOC and Perry of the Shiloh Discussion Group are now hosting a thread wherein members submit their top/favorite seven books written about the battle [book thread URL here]. As of this writing a number of interesting lists have been submitted. 1. Shiloh: Bloody April by Wiley Sword (Morningside, 2001 revised edition). Like all book length narrative histories of Shiloh, Sword's account of the second day of fighting is meager in comparison to the first [perhaps Cozzens will be the first to remedy this], but his book remains my favorite, still the best tactical treatment of the fighting around. 2. Shiloh: The Battle That Changed the Civil War by Larry J. Daniel (Simon & Schuster, 1997). While I prefer Sword's account of the April 6 fighting, I would consider Daniel's book the best overall treatment of the campaign and battle. 3. Shiloh and the Western Campaign of 1862 by O. Edward Cunningham, ed. by Gary D. Joiner and Timothy B. Smith (Savas Beatie, 2007). Since its publication, much has been made of Cunningham's writing style and the judicious manner in which each aspect of the battle is examined (i.e. no section's importance is 'hyped' to the detriment of another), but I still stubbornly cling to Sword and Daniel. 4. The Battle of Shiloh and the Organizations Engaged by D.W. Reed (Univ. of Tennessee Press, 2008). Deeply influential in the battle's historical presentation, both in print and battlefield park interpretation, Reed cannot be overlooked. His book is a still-useful classic, and the large color maps [existing as pull outs in the earlier editions, but on CD in the latest] are an added resource. 5. Seeing the Elephant: Raw Recruits and the Battle of Shiloh by Joseph Allan Frank and George A. Reaves (Greenwood, 1989). Draws upon a large volume and variety of primary source materials (from both sides) to provide readers with a personalized view of the battle, and within an analytical-statistical framework. 6. The Timberclads in the Civil War: The Lexington, Conestoga, and Tyler on the Western Waters by Myron J. Smith (McFarland, 2008). Smith's study isn't a 'Shiloh book' by the strictest definition, but its coverage of the naval aspects of the Shiloh campaign and battle is presented in unmatched detail. 7. Shiloh: A Battlefield Guide by Mark Grimsley and Steven Woodworth (Bison, 2006). The best of the Shiloh guidebooks, from the best current series (This Hallowed Ground) of guidebooks. Another mention: I can't in good conscience include a book that I haven't seen or read on my list, but, thanks to the SDG, I've heard such good things about Shiloh, Shells, and Artillery Units by George F. Witham (Riverside Press, 1980) that I wanted to at least mention it. Plus, I can't resist a good artillery book of any kind. Hopefully, it will be reprinted someday (which, of course, will happen the day after I add an overpriced used copy to my library). 1. Fort Wool: Star-Spangled Banner Rising by J. Michael Cobb (The History Press, 2009). Beginning in the 1820s and through the two World Wars, what would become Ft. Wool faithfully stood watch over Chesapeake Bay. This complete overview of the installation's history devotes three chapters to the Civil War period. On another note, the publisher has a new website. 2. Bill Arp's Peace Papers: Columns on War and Reconstruction, 1861-1873 by Charles Henry Smith (Bill Arp), new introduction by David B. Parker (Univ. of South Carolina Press, 2009). New paperback edition; part of the Southern Classics Series from USC Press. 3. The Missouri State Guard: A Selected, Annotated Unit Bibliography by Thomas Pearson (Author - Lulu, 2009). While I welcome the appearance of any new publication dealing with the Missouri State Guard, this reference book is really too narrowly selective in the compilation of its source list to be of much use for researchers. The bibliography lists only 36 sources, nearly all published. Additionally, many from the list are reference books, which leads to a highly repetitive unit by unit source list. Readers wishing to learn more about what material is available for serious original inquiry into the MSG remain better served by consulting the excellent Sterling Price's Lieutenants, a classic work. The new edition's bibliography lists almost 200 source collections in the unpublished material section alone. If a future edition is in the offing, it is hoped that Pearson will broaden his net, as, in its present form, his book cannot be recommended. Gottfried: "The Maps of First Bull Run: An Atlas of the First Bull Run (Manassas) Campaign ... "
As mentioned in the introduction to his latest atlas study, The Maps of First Bull Run, Bradley Gottfried has embarked on an ambitious publishing project. The author/cartographer of the first two volumes of the Savas Beatie Atlas Series, Gottfried hopes to eventually cover all of the major eastern theater campaigns through Appomattox1. Though similar in format to the earlier Maps of Gettysburg [with map sets divided into "action sections" of two or more maps, each accompanied by a full page of descriptive text], Gottfried's new atlas book sports some notable improvements. Among these, color cartography has been employed and criticism of the previous volume's lack of time range estimates for the events described by each map has been addressed. Striking a judicious balance between inherent space limitations and the need for detail commensurate with that of the accompanying maps, the author's encapsulated text summaries of the Bull Run and Ball's Bluff battles are quite good, blending participant quotes with his own narrative (all annotated). By his own admission, the accounts are conventional in content and analysis, with heavy reliance on authoritative published works rather than extensive original research2. Gottfried also consulted with noted experts, such as Jim Morgan for the book's lengthy Ball's Bluff section. The color cartography (as with the Gettysburg volume, designed and executed by Gottfried himself) is multi-featured, with troop positions and movements displayed at regimental and battery scale. What the maps lack in artistry, they make up for in functionality, providing enough visual information to satisfy most serious students while at the same time avoiding unnecessary clutter. On-map terrain features include woods, fields, fencing, ridge lines, streams, towns, roads, and trails. That said, elevation contour lines (like those found on topographical maps) would have been a nice touch for the more 'zoomed-in' tactical maps. The battle action is very easy to follow on the maps provided, and sufficiently detailed at regimental scale. My only significant objection is with the initial placement of the opposing lines atop Henry House Hill. While the distances mentioned in the text are in line with convention, in the series of maps the Confederate battle line is located too close to the hill's northwest face3. Overall, The Maps of First Bull Run provides us with arguably the best balanced set of maps available for this important early war campaign and battle4. I wouldn't hesitate to recommend the atlas to interested students of all background levels. Overall, the step-wise clarity of the cartography makes for an excellent battlefield reference, and Gottfried's Bull Run narrative is really one of the best tactical overviews available. 1 - Vol. 1: The Maps of Gettysburg. For Gottfried, the Maryland Campaign is next. The western theater will be addressed this fall with the release of David Powell's and David Friedrichs's The Maps of Chickamauga . One hopes for a continued series balance between east and west. 2 - Along this line, one item of interest is the book's timing of Brig. Gen. Barnard Bee's mortal wounding. The subject remains controversial, and, if I recall correctly, Gottfried's acceptance of the 2-4 p.m. time frame is among the latest put forth. 3 - By the maps' given scale, the southern batteries and their immediate supports (Jackson's brigade) are 150-175 yards from the Union guns positioned beside Henry House, far closer than any of the 300-400 yd. estimates from the best sources. Inexplicably, there's also a sliver of woods projecting between the lines and up to the yard of the Henry House, a terrain feature I've neither seen nor read about previously. 4 - Bearss's map study is essential research material, but very visually cluttered. The level of combined terrain and troop movement detail in Gottfried's maps easily exceeds those of earlier book length narrative studies (e.g. from Davis, Hennessy, Rafuse, and Detzer). 11. Baring the Iron Hand: Discipline in the Union Army by Steven J. Ramold (N. Illinois, October). Sure, the subject's been covered in scattered places, but an up-to-date book length synthesis should be well received. Excerpt from the publisher's description: "Unable to prosecute the vast number of soldiers who committed offenses, professional officers reached a form of populist accommodation with their volunteer soldiers. Unable to eradicate or prevent certain offenses, the army tried simply to manage them or to just ignore them. Instead of applying traditionally harsh punishments for specific crimes as they had done in the antebellum period, the army instead mollified its men by extending amnesty, modifying sentences, and granting liberal leniency to many soldiers who otherwise deserved the harshest of penalties." In my view, enthusiasts and scholars continually misinterpret the policy vs. practice aspects of The Hard Hand of War, taking from it a much too broad interpretation of the degree of restraint among Union soldiers. 12. U. S. Grant: American Hero, American Myth by Joan Waugh (UNC, October). 13. Army Life: From a Soldier’s Journal by A. O. Marshall, ed. Robert G. Schultz (Arkansas, November). Looks like Schultz will have two books out this year. The journal of Marshall, a private in the 33rd Illinois, should prove useful for students of the Trans-Mississippi theater and the Vicksburg Campaign. 14. Portraits of Conflict: A Photographic History of Missouri in the Civil War eds. William Garrett Piston and Thomas P. Sweeney (Arkansas, November). I reviewed the Tennessee volume from the Portraits of Conflict series a while back. The Missouri entry has apparently been in the works for a long time, and I am glad to finally see it scheduled for later this year. 15. 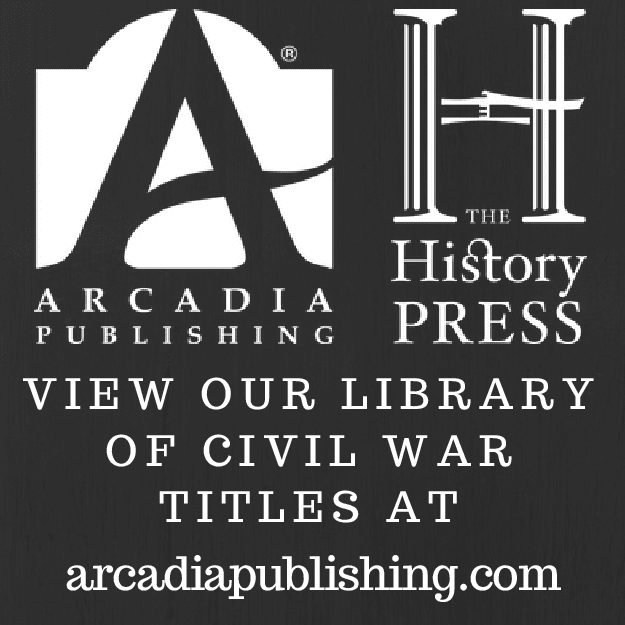 Missouri's War: The Civil War in Documents ed. Silvana R. Siddali (Ohio, November). I haven't examined any of the other books in this series from Univ. of Ohio Press, but my interest in this one should be obvious to any frequent reader of this blog. 16. Cavalry of the Heartland: The Mounted Forces of the Army of Tennessee by Edward Longacre (Westholme, November). 17. Blue and Gray Diplomacy: A History of Union and Confederate Foreign Relations by Howard Jones (UNC, December). I'm not sure when the last complete scholarly overview of Civil War foreign relations, as seen from both sides, was published, but these types of books are always useful. 18. Isham G. Harris of Tennessee: Confederate Governor and United States Senator by Sam Davis Elliott (LSU, January '10). 20. Justice in Blue and Gray: A Legal History of the Civil War by Stephen C. Neff (Harvard, February '10). Like the diplomacy study above, this one looks comprehensive. From the publisher: "Neff examines the lawfulness of secession, executive and legislative governmental powers, and laws governing the conduct of war. Whether the United States acted as a sovereign or a belligerent had legal consequences, including treating Confederates as rebellious citizens or foreign nationals in war. Property questions played a key role, especially when it came to the process of emancipation. Executive detentions and trials by military commissions tested civil liberties, and the end of the war produced a raft of issues on the status of the Southern states, the legality of Confederate acts, clemency, and compensation. A compelling aspect of the book is the inclusion of international law, as Neff situates the conflict within the general laws of war and details neutrality issues, where the Civil War broke important new legal ground." * Red River Campaign of 1864 and the Loss by the Confederacy of the Civil War by Michael J. Forsyth (McFarland, July?). * Civil War Macon: The History of a Confederate City by Richard William Iobst (Mercer, September). * Mr. Lincoln's Forts: A Guide to the Civil War Defenses of Washington by B.F. Cooling (Scarecrow, October). There will also be a new hardcover edition from this publisher [both priced at a premium - $75 list vs. $50 for the paperback]. Now that July is with us in earnest, most of the Fall/Winter catalogs are out. Undoubtedly, there will be many more dates and titles unfurled in coming weeks and months [e.g. we still await the UT Press catalog], but I've come up with a reading list of twenty new books that I am looking forward to (plus some reprints). 1. Lincoln's Political Generals by David Work (Illinois, July). I believe this is the first specialized scholarly work dealing with the North's political generals to be published since 2003's The War Within the Union High Command: Politics and Generalship During the Civil War. 2. War Like the Thunderbolt: The Battle and Burning of Atlanta by Russell S. Bonds (Westholme, August). I am reading this one right now. Given that I'm not too far along, it is difficult to describe. It's not a campaign or battle history in the traditional sense, nor is it what we might think of as social history, rather more of a personality driven narrative of events accompanied by many compelling historical vignettes [the book opens with a fascinating look into the filming of the famous Atlanta scenes from the movie Gone With the Wind]. 3. General Sterling Price and the Confederacy by Thomas C. Reynolds, ed. by Robert Schultz (Missouri History Museum Press, September). Confederate Missouri Governor Reynolds's incomplete manuscript, held by the Missouri Historical Society, is published here for the first time, edited by regional historian Bob Schultz. 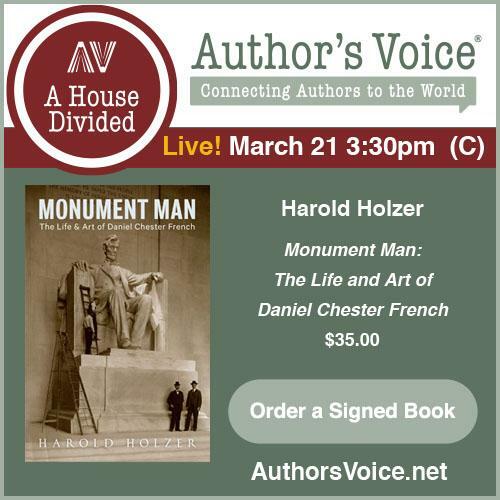 The book should provide interested readers with some critical insights into the Civil War career of one of the towering figures of the Trans-Mississippi theater. 4. Punitive War: Confederate Guerrillas and Union Reprisals by Clay Mountcastle (Kansas, September). From the book description: "Showing how much of the impetus for retaliation originated from the bottom up, starting in the western theater in 1861, he describes how it became the most influential factor in convincing Union generals,..., that the war needed to be extended to include civilians and their property. The result was a level of destructiveness that has been downplayed by other scholars--despite the evidence of executions and incidents of entire towns being burned to the ground." I like the directions Mountcastle is going with his study. It looks like it will be a good one to pair with Daniel Sutherland's recent book. 5. Campaign for Wilson's Creek: The Fight for Missouri Begins by Jeffrey L. Patrick (State House/McWhiney, September/October). A long delayed book that I normally wouldn't be too excited about, but I am a sucker for anything having to do with Wilson's Creek, and Jeff Patrick, the NPS librarian at Wilson's Creek National Battlefield, should have something interesting to say. 6. Race and Radicalism in the Union Army by Mark A. Lause (Illinois, October). Among other things, an examination of the interrelationship between white, black, and Indian units of the Union's Army of the Frontier. 7. Executing Daniel Bright: Race, Loyalty, and Guerrilla Violence in a Coastal Carolina Community, 1861-1865 by Barton A. Myers (LSU, October). Guerrilla warfare, southern unionism, issues surrounding the expanding combat role of black Union troops -- this book's subject matter lies at the intersection of several of today's hot topics in Civil War scholarly publishing. 8. West Pointers and the Civil War: The Old Army in War and Peace by Wayne Wei-siang Hsieh (UNC, October). 9. Fields of Blood: The Prairie Grove Campaign by William L. Shea (UNC, October). What can I say, I am looking forward to this one most of all. I hope it doesn't get delayed. 10. The Maps of Chickamauga: An Atlas of the Chickamauga Campaign, August 29 - September 23, 1863 by David Powell and David Friedrichs (Savas Beatie, October). When it comes to short form analysis of various military aspects of the Civil War in the western theater, Dave Powell has one of the best minds around. Finally, we get to see something from him in book length form, with the added bonus that it deals with his best subject. 1. Petersburg 1864-65: The Longest Siege by Ron Field and Peter Dennis (Osprey Publishing, 2009). I don't know when I'll get to this one, so take a look at Brett's review on TOCWOC. Osprey has a couple of interesting titles (to me, anyway) coming up for release later on in the summer from their Elite Series - American Civil War Railroad Tactics (mid August) and American Civil War Guerrilla Tactics (late September). 2. A Thousand Texans: Men of the 9th Texas Cavalry by Stephen S. Kirk (Two Trails, 2009). This is the second of Kirk's regimental/roster studies of the units of Ross's Texas cavalry brigade (go here for a review of the first, Sul Ross' Sixth Texas Cavalry: Six Shooters & Bowie Knives). 3. The Battle of Blackwell by John Hampton Hollingsworth (Two Trails, 2007). Books about the Civil War in SE Missouri are rare, and this serviceable booklet (78 pages) is the first to cover Missouri State Guard Brig. Gen. M. Jeff Thompson's attempt to break the Federal railroad communications between St. Louis and Pilot Knob. Sandow: "Deserter Country: Civil War Opposition in the Pennsylvania Appalachians"
During the past couple decades, numerous Civil War studies detailing active government resistance among residents of Appalachia and other isolated regions have been published. However, nearly all center their attention on the southern Confederacy and border states, making Robert Sandow's study Deserter Country: Civil War Opposition in the Pennsylvania Appalachians all the more original and valuable. The author's specific area of interest is the so-called "lumber region", a relatively isolated expanse of land comprised of roughly ten counties in the north-central part of the Keystone State. Sandow's introduction surveys well the prior literature dealing with the subject of northern dissent. He admirably seeks to move his readers past the entrenched notion of the Democratic Party as a disloyal opposition to the Republican-led federal government. An early, and very important, chapter is devoted to the examination of various, and often competing, concepts of loyalty. Recruitment patterns in the lumber region are also discussed, and, like most contested areas, significant numbers did volunteer for service in the Union armies, men like those that filled the ranks of the famous "Bucktail Regiment". The author examines the reasons behind the fervent war opposition in the Pennsylvania lumber region, what made it perhaps the only true "deserter country" in the North. He finds economic rights to be at the forefront of what is obviously a multifaceted set of causative issues (among them emancipation, conscription, class, ethnicity, and local identity) on local and national scales. A particularly curious one stems from the sometimes violent 1850s conflict between the small, independent "raftsmen" and the industrial logging operations. Republican support for the companies, real and imagined (it could often be a gray distinction), alienated the former, largely Democratic, individuals and groups. The character of the resistance is treated at length, ranging from individual lying and concealment all the way to the robbery and assault of partisan political foes, provost marshal's office officials, and conscription officers. 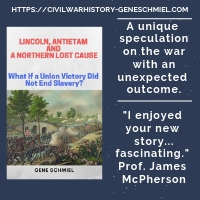 While most Civil War readers are familiar with the 1863 New York City draft riots, it is a good bet that even the best read students are unaware of the full fledged military operations conducted in the Pennsylvania lumber region. In the last chapter, Sandow recounts in some detail the 1864 efforts [the Fishing Creek (in nearby Columbia County) and Clearfield County expeditions] to enforce conscription and protect Republican supporters. The 16th Regiment of the Veteran Reserve Corps spearheaded the Clearfield County expedition, a rather arduous mission given the physical handicaps typical of many members of the formerly named Invalid Corps. The author recounts how many residents viewed the military effort as a partisan political move meant to suppress the Democratic vote in the upcoming presidential election, a notion supported by the presence of federal troops at the polls and the lack of evidence of organized resistance from bogeyman groups like the Knights of the Golden Circle and Democratic Castle. Sandow notes that much of his findings must be inferred, due to a severe lack of personal primary source materials in the form of diaries, letters, memoirs, etc. from dissenters and active resisters of federal authority. What he did do was make the best of what is available, namely partisan newspapers, court documents, and other government files. For this reason, his conclusions probably cannot escape controversy. On the other hand, his arguments (supported by several dozen maps, tables, and figures in the appendix) are dispassionate and well reasoned. Short in length but overflowing with fascinating information and analysis, Deserter Country greatly expands our knowledge of the extent, nature, and limits of Civil War dissent in the North, and rural Pennsylvania in particular. Sandow's study is essential reading, and his highly recommended for inclusion in personal and public libraries everywhere. Booknotes - "The Civil War in the Big Sandy Valley of Kentucky, 2nd Edition"
Although regarded as a bit of a Bluegrass State classic, I found the maps crude and military detail lacking in John David Preston's The Civil War in the Big Sandy Valley of Kentucky (Gateway Press, 1984). On the other hand, its discussions of the social and political landscapes of Floyd, Johnson, Lawrence, and Pike counties were informative. Nevertheless, while thumbing through the book review section of the most recent issue of a popular magazine, I was pleasantly surprised to find that a new expanded edition had been released sometime last year. The review was positive, and, upon my own rough inspection upon receiving the book, I found myself greatly encouraged by the new edition. The Civil War in the Big Sandy Valley of Kentucky, 2nd Edition (Gateway Press, 2008) is about three times the size of the original, and, on the face of it, appears to be a vast improvement all around and a worthy pick-up for Civil War Kentucky students. Booknotes - "Never for Want of Powder: The Confederate Powder Works in Augusta, Georgia"
I recall Dimitri Rotov marveling about the quality and improbability of this book a while back, but I haven't seen Never for Want of Powder: The Confederate Powder Works in Augusta, Georgia by C. L. Bragg, Gordon A. Blaker, Charles D. Ross, Stephanie A. T. Jacobe, and Theodore P. Savas (University of South Carolina Press, 2007) with my own eyes until now. It's a massive work, roughly similar in coffee table book dimensions and weight to the O.R. Atlas. I can't do a better summary than his own. Every book is a labor of love to some degree, but this one really goes the extra mile. 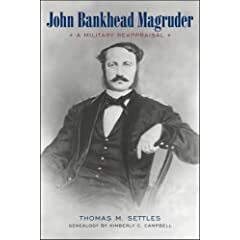 Settles: "John Bankhead Magruder: A Military Reappraisal"
During the first twelve months of the Civil War, from the Battle of Big Bethel through the Seven Days, Major General John Bankhead Magruder was one of the most important Confederate officers on the Virginia front. Yet, then as now, controversy surrounds his military service in the eastern theater. Historian Thomas Settles's new biography, John Bankhead Magruder: A Military Reappraisal provides a sharply revisionist treatment of its subject's career.1. Competence and alcoholic impairment comprise the two main issues surrounding Magruder's military career. Settles effectively refutes the charges of incompetence, and provides solid arguments against contemporary assertions that the general was inebriated during the lower Peninsula and Seven Days fighting. With an effective use of primary sources, Settles constructs a well supported picture of Magruder as a conscientious and talented military leader. The Virginian West Point graduate performed well as an artillery officer in the Mexican War. During the early phases of the Civil War, Magruder won the Battle of Big Bethel2 and effectively blocked the Union advance up the Virginia Peninsula for many weeks, allowing for the concentration of Confederate forces necessary to oppose it. It is a consensus view that the Army of Northern Virginia's staff work was wretched during the Seven Days, and Settles asserts (correctly, I believe) that command level confusion was the primary source behind Magruder's disappointing results at Savage Station and Malvern Hill3. On the other hand, the author recognizes the general's proclivity for launching piecemeal attacks4. Magruder's very risky, but well conceived and executed, New Year's Day 1863 recapture of Galveston, Texas is appropriately put forth as an effective counter to lingering charges of command incompetence. These military actions and others are recounted by the author in more than sufficient detail for most readers, but the decision to include no maps was unfortunate. As an example, a map of the road network used during the Seven Days battles would have greatly enhanced reader comprehension of the controversies raised by the army command staff's poorly conceived orders and by the confusion they transferred to Magruder's local guides. Since the Trans-Mississippi Department is often seen as the dumping ground for failed generals from other theaters, Magruder is often paired with Major General Theophilus Holmes as subjects for banishment due to disappointing Lee during the Seven Days. The truth is that Magruder was appointed to head the department weeks before, with the transfer temporarily suspended until the end of the current campaign. Settles points out that Lee himself (in his endorsement of Magruder's report, and otherwise) praised Magruder's efforts and did not directly express disappointment; however, a reading of Lee's wording could indicate more 'damning by faint praise' than Settles allows. Also, no objection by Lee to Magruder's departure seems to exist. Charges of drunkenness are always difficult to assess at a historical distance. One must take into account the standards of the time, as well as, in the consideration of the authorship of primary source materials, issues of loyalty by supporters and self interest on the part of detractors. That said, Settles very effectively counters the accusations (they still linger in the literature today5) that the general was impaired by alcohol while directing his forces on the battlefield, although one might justifiably quibble with the author's confident claim of exoneration. In the end, however, if one must choose one interpretation or the other, Settles' contention is by far the most persuasive and best supported by the evidence. Settles also seeks to correct several mistakes commonly made by other historians about Magruder's background, such as his birth place and date as well as what first name he went by (John or Bankhead). Evidence from letters supports the former. The author writes judiciously, and well. Heavily dependent on primary sources, his research is solid. The general's personal papers accumulated prior to 1850 were unfortunately consumed in a fire, but Settles was able to consult a number of collections of later Magruder materials located in repositories across the country. Additionally, with footnotes an increasing rarity, the Southern Biography Series from LSU Press is to be commended for allowing the author's notes to be presented at the bottom of each page6. In addition to those with a more narrow interest in the life and military career of John B. Magruder, this study is recommended reading for more general students of the eastern and Trans-Mississippi theaters. Whether one agrees with all of his conclusions or not, Settles's revisionist biography provides the type of dispassionate (and largely convincing) analysis, backed by primary source materials, that can persuade minds of serious readers open to change. 1 - Settles characterizes the most recent Magruder biography, Paul Casdorph's Prince John Magruder: His Life and Campaigns (Wiley, 1996), as a work largely affirming the conventional view of Magruder's personal and professional faults. Unfortunately, I have not read Casdorph's book, and thus cannot provide my own comparison. 2 - Credit is often given to D.H. Hill for this victory (with little if any mention of the role of Magruder), but Settles asserts that Magruder was on the field, actively directing the Confederate force. 3 - Of the major works on the subject, Brian K Burton's Extraordinary Circumstances (Indiana University Press, 2001) seems closest to Settles in its assessment of Magruder's performance during the Seven Days. 4 - Piecemeal attacks were hardly uncommon among Civil War generals, especially during the early stages of the conflict. They were a hallmark of Stonewall Jackson's tactical offensives, yet he has largely escaped a similar scale of condemnation [notable exceptions are recent works by Gary Ecelbarger and Peter Cozzens. While laudatory overall, Krick's study of Cedar Mountain is also critical of Jackson's tactical failings]. 5 - According to Settles, Casdorph's Prince John Magruder takes an opposing view on the matter. 6 - Southern Biography Series (Bertram Wyatt-Brown has since retired as series editor, to be replaced by Andrew Burstein). Brett for organizing a great series of Top 10 Gettysburg Books posts. There were a good number of lists, with a healthy mix of the expected and unexpected. An especially interesting one to me was Elektratig's The Road to the Road to Gettysburg. Gillispie: "Andersonvilles of the North: The Myths and Realities of Northern Treatment of Civil War Confederate Prisoners"
Controversies over Civil War prisons still generate much heat. Sadly, all too many arguments are of the 'our prisons may have been bad, but yours were worse [or deliberately worse]' quality, as if some great moral superiority is gained from running least terrible facilities. Fortunately for open minded readers, in recent years a number of well researched POW camp studies have emerged to help interested students sort through competing claims. James M. Gillispie's Andersonvilles Of The North is just such a work. It is a dual-focused one, studying both the historical memory (an often inaccurate picture, flavored by post-war animosity and defensiveness about their own prisons) and the realities as gleaned from a variety of primary source materials written during the war. The author also makes good use of the Medical and Surgical History of the War of the Rebellion. Gillispie's well researched study begins with a survey of each "side" of the debate, before delving into general POW policies of the U.S. government. From there, the book moves on to survey the more specific practices of major facilities located across the North [Alton, Camp Chase, Camp Douglas, Camp Morton, Elmira, Ft. Delaware, Johnston's Island, Rock Island, and Pt. Lookout]. A pair of appendices were included. The first, a comparative examination of nine major Union prison hospitals with the large Confederate facility at Chimborazo, found comparable patient recovery rates (except for Elmira). The other appendix sifts through leading factors (the top three for each camp) that resulted in Confederate POW deaths, as well as disease mortality rates. The author concludes that there is little evidence of deliberate mistreatment (at least on a mass scale), with most deaths the result of inexperience at prison administration, prisoner crowding [with its concomitant poor sanitation and disease], and an increasingly poor physical condition among incoming Confederate prisoners. It is doubtful that Gillispie's brief, but thoughtful and very well articulated, study could be considered a last word on the subject, but this up-to-date corrective history represents an important contribution to the growing base of modern scholarly literature dealing with Civil War prisons. Highly recommended. Brett Schulte at the TOCWOC blog reviewed this title earlier in the year (link).